Knights of Pen & Paper 2 offers players the chance to organize a party of virtual friends and play a pen & paper RPG that requires neither pen nor paper. This expansion will see the in-game party returning to their roots and undertaking a classic RPG quest for high-level characters, as they seek out and slay the ultimate monsters known to game-kind. Included for all players alongside the new expansion are the new in-game class and the extensive bestiary, allowing fans to stalk their favorite monsters. New Locations and Quests: Guide a high-level party on an epic quest to return to their roots and undertake the ultimate in classic RPG objectives: Dragon-slaying. New Class: The Knight - Now more than just a word in the game title. New Player Type: Let the fastidious Bookworm join your game table and make use of her obsessive in-game research. The Bestiary: Discover details about the assorted baffling creatures of Paperos. -> Did we mention dragons? 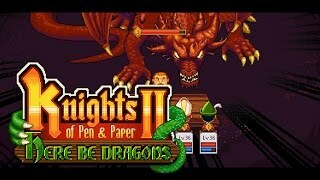 This content requires the base game Knights of Pen and Paper 2 on Steam in order to play.